White Wolf : Man rescues a terrified baby elk after she became trapped in mud in Arizona. 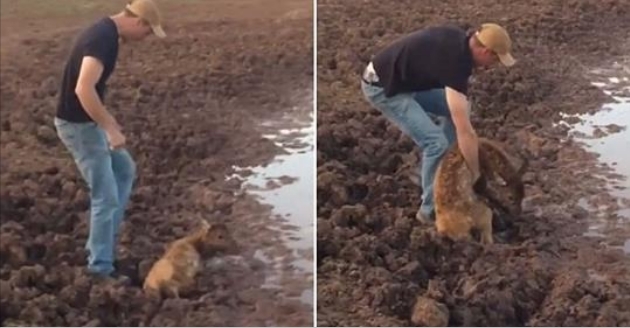 Man rescues a terrified baby elk after she became trapped in mud in Arizona. A baby elk was rescued by a walker after it got trapped in mud up to its stomach. A couple was walking in the woodlands of Arizona when they came upon the baby animal screaming for help. In a video of their encounter, any time the man touches the elk it cries, but he perseveres to save the animal. The man tugs at the animal, helping its legs come loose from the mud. He guides the elk's legs out of the mud, and then jokes that he himself will get stuck in the mud. After the rescue, the scared baby is too exhausted to move. It then collapses on the ground to rest. Did you know? Elk are primarily crepuscular, browsing mainly at dawn and dusk. Only male elk grow antlers, which are shed each year. A young deer is called a fawn. An adult male deer is called a buck. The female is called a doe. Responses to "Man rescues a terrified baby elk after she became trapped in mud in Arizona." He should recover after a rest but he will need his mother for milk. Hope she didn't go too far off. Male elk are stags. Adult females hinds. Young elk, calves.